See, usually I’m very organized and I put all of my stash into Ravelry and keep ball bands and all that jazz, but this yarn has a story. I acquired it sometime before October 11, 2006 when it first appeared in a picture of my sock stash for Socktoberfest. *until tonight when I was going crazy trying to figure out the details of this yarn! 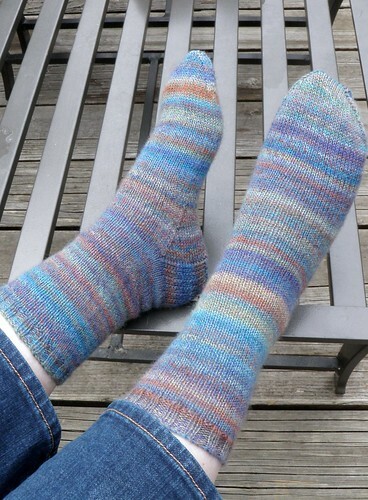 In the fall of 2008, I gave the yarn to my mom to start her second pair of socks and deleted it from my Ravelry stash. She declares that she doesn’t like the way they look and is going to go buy some other yarn, so I pull the socks-in-progress off the needles – of course she wanted to keep the needles! – and take them home to knit for myself. 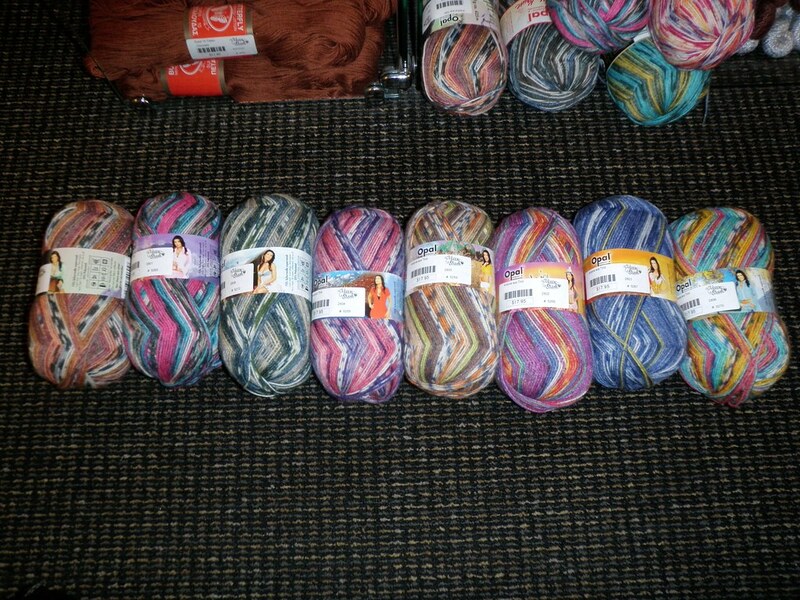 This is all well and good, except for the fact that I have absolutely no idea what the yarn is. And, being me, this starts making me crazy when I try to put the project into Ravelry. 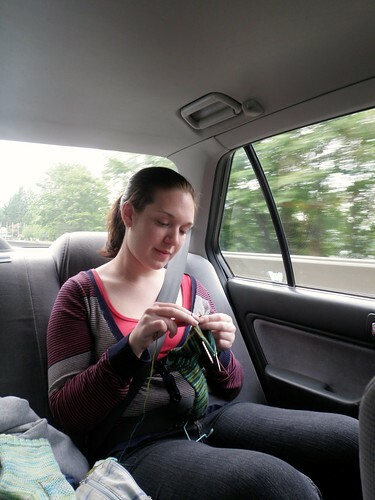 So I spent several hours last night going through my blog archives and trying to find where I posted about the yarn, since I seem to recall that it was a gift. I never posted. But I did find the stash pic above which gave me a clue about when I got it. Then while falling asleep I think that I wouldn’t have deleted the stash pics from my Flickr. It popped into my head at knitting group, so tonight when I got home I went back through my Flickr archives trying to find the time when I was photographing my stash in the summer of 2007 shortly after getting into Ravelry… but I couldn’t find it. 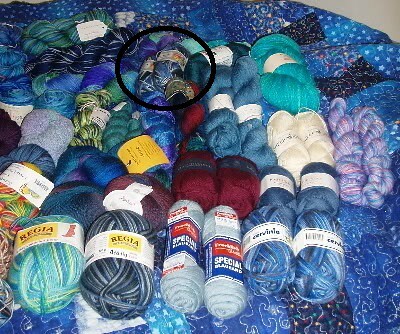 In fact, I came and started this blog post thinking I would beg for the help of the internet in identifying the yarn from that first crummy photo, when I suddenly thought “Hey, didn’t I have a different Flickr name once?” and found it. Now, as for the title of today’s post… I’m going to whine a bit. 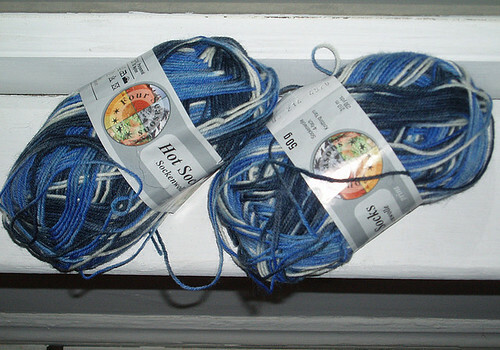 I was so very excited for the Kollage Square Circular needles to come out in sock sizes with cables that weren’t a string. I love knitting magic loop, but the original cable was *so* flexible (really basically a string) that I never bought any after trying a friend’s needles. Well, after preordering and waiting for a backorder I finally got my needles – a pair each of 40″ circular needles in 2.25 and 2.5mm. I enjoyed working with them, but the 2.25mm needle had a weird join – the metal was crimped out a bit at the join and snagged the yarn. I emailed Kollage, and they were very nice about replacing my needle. Last night I opened up the replacement 2.25mm needle and started a pair of socks – the join is fine. Then when cleaning my desk I picked up some socks on the old needle, which I had stopped working on because of the annoying join, and the cable fell out of the needle when I picked them up. Hrm… probably because of the wonky join. Well, apparently not because as I was working on the pair of socks from last night on the new needle, the cable popped out on that one too! Keep in mind I’ve only used these needles for about 1 hour last night, and maybe 15 minutes this morning before the join broke. Guess it’s time to get the super glue. Totally unrelated to knitting, I really like Instagram. You can take fun little square photos with your smartphone, apply various pictures, tag them with a location and post them to your twitter / Facebook / whatever. I haven’t been posting much because I’ve been hard at work designing and knitting secret things, but here’s a bit of an update. My new pattern, Isaz on Ravelry (linked) and Knit Picks IDP. Last weekend I met my friend Nicole for brunch (and sadly not much knitting) but while I was waiting I got a hot chocolate and worked on the Ishbel that I’m knitting in ivory Handmaiden Sea Silk for my friend Christina’s wedding that I’ll be attending in mid-June. Never fear, I am now well into the lace on this shawl, and I have until June 9th. 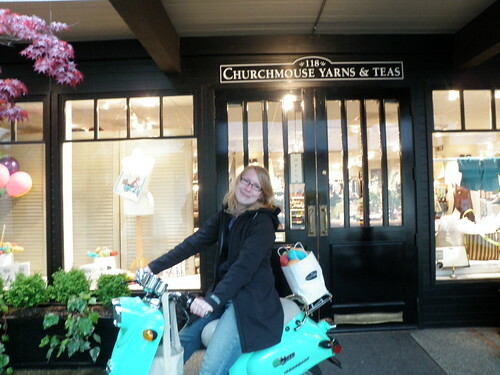 Today Nicole and Mimi and I went on a bit of the Puget Sound LYS Tour. 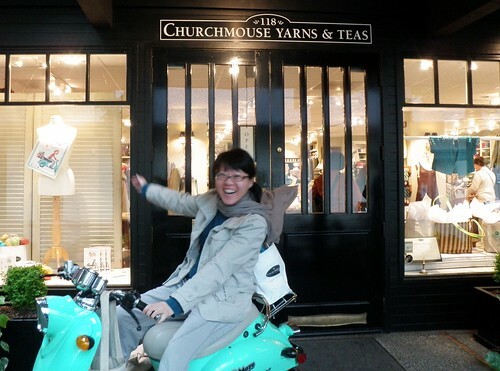 Last year I did the whole thing (I believe last year it was 27 shops!) so this year I felt like I didn’t need to try to do it all again. Instead we just hit some of the new shops we hadn’t been to and a couple old favorites that aren’t close to home, like this one in West Seattle. They’re in a merino / tencel 50:50 blend so the yarn is a bit grabby, and there are some interesting stitch manipulations required. Because of this I need pointy but slippery needles. Apparently that’s not easy to find. Above we have a bunch of my 2.25mm sock needles. On the far right are the Knit Picks circulars, which are the pointiest by far but unfortunately much too grabby. At least in my hands, the finish wears off these needles pretty quickly – you can see some gold showing through in the top of the picture – and once the needles are dull silvertone / goldtone the stitches are really hard to move along them. Moving to the needle 2nd from the right, you see a pair of Hiya Hiya steel needles. These are some of my favorites because they’re nice and slippery and pretty pointy – but in this case not *quite* pointy enough. The next one to the left is an Addi Turbo. Strangely it seems to be about the same pointiness as the Hiya Hiya needle – but not pointy enough. Nice and super slippery though! And on the far left, we have my brand new Addi Lace needle. These are unfortunately not as slippery as the regular Addis, which caused me to agonize about whether it was worth buying them. I had a pair years ago, but my skin and the brass didn’t get along and the needles would get very tarnished and smell funny, so I ended up giving them to a friend. I’d heard that they have a new coating and hoped this would help with that issue. 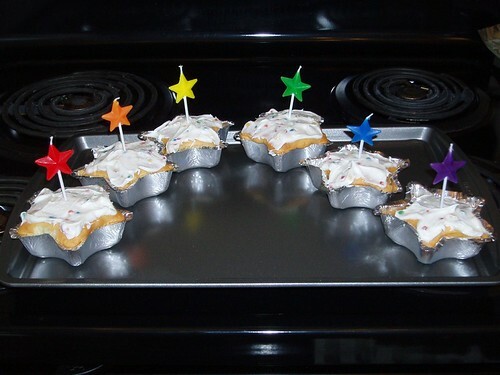 So far so good – they’re certainly pointy enough. 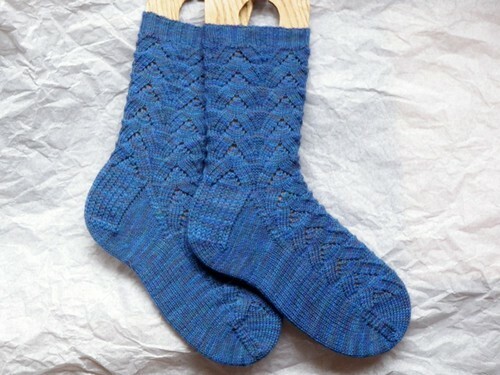 And now some other socks I’m knitting, these ones out of my handspun. They also happen to be on my very favorite type of sock knitting needle: Inox Express. Unfortunately they come in 2.5mm but not 2.25mm. The perfect blend of slippery and pointy, but alas, not the right size. These socks were supposed to be knit on my Boston to Seattle cross-country move in the U-Haul, but unfortunately due to a last minute packing mishap (my designated container of things to come with me in the truck cabin accidentally got put in a box and packed in the back) that was not to be. It’s a little sad that it has taken me this long to get going on them! I am apparently a bad blogger. I had no idea it had been more than a month, and I have no excuse since I have not one but *two* finished pairs of socks to share! I’ve also been busy with some secret knitting, but you won’t see that for a while. Well, let’s get to it. MJ and I decided on something simple for our next pair of twin socks – I talked about them a while back. Our goal was to finish them by the summer solstice. Unfortunately, some secret knitting got in the way for me, but I was close. The next simple socks in line were my Spring Trek socks. I was inspired by my plain stockinette Trekking birthday socks from a couple years back, and this yarn was my very first Trekking – a gift from my mom years ago. I finished them while I was at the Oregon Coast with my family for the 4th of July weekend. I spent some time knitting and some time on the beach. On the 4th the tide was quite low in the middle of the day, so I went for a walk with my sisters. I was trying to take a picture of this exposed rock when a wave started coming and I ran so I wouldn’t get my shoes wet. As I was running, something fell out of my pocket. My first thought was “Oh no! My phone!” but thankfully it was not my phone – instead it was my camera. 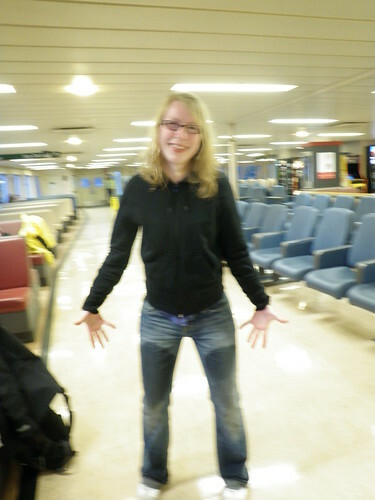 I had a horrible sinking feeling as the wave washed over my camera and then I realized… it’s waterproof up to 10 feet. Apparently Olympus doesn’t lie! This picture was taken about 1 minute after a salty ocean wave washed over my camera. It’s still working great. Last weekend was the annual LYS Tour around here. 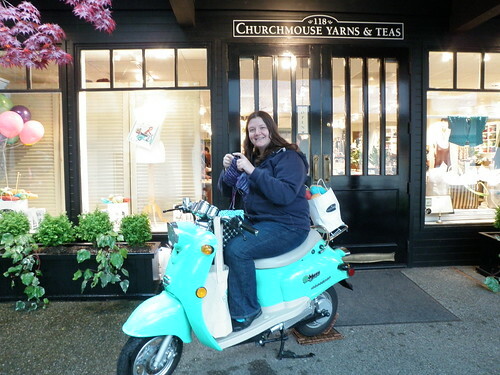 The yarn stores band together, offer a free one skein pattern and a discount on the yarn to knit it, and us knitters run around crazily getting our passports stamped at the stores – 25 this year! It was my first year actually touring on the tour, since last year I attended every day at one store – the one where I worked. Thursday night after work I headed to 4 of the stores that are more or less on my way home from work… Weaving Works, Bad Woman, Full Circle (this was a new one for me) and Fiber Gallery. Friday I met up with a couple of friends and hit So Much Yarn on our way out to Bainbridge where we visited Churchmouse and had a lovely dinner at Cafe Nola. 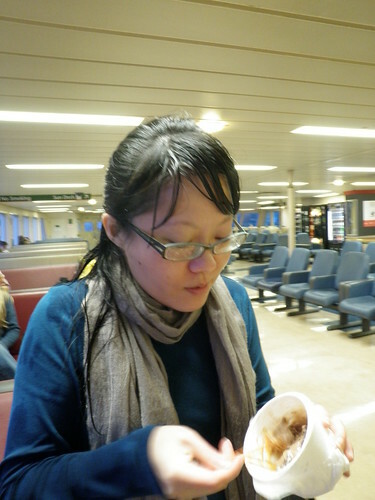 … while eating ice cream from Mora! A lovely but very chilly evening. 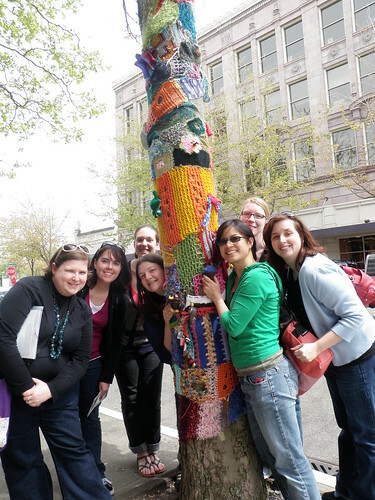 The next day some of us joined a bunch of others for a trek northward to 11 yarn stores! One of the stores had some lovely knitfiti outside. 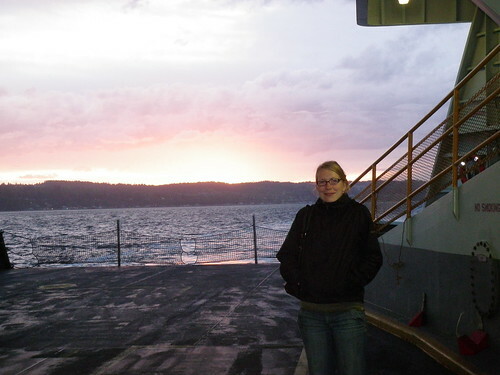 After some dinner we took yet another ferry home. All in all an amazing weekend, now back to the secret knitting! Yep, that guy is “knitting” what appear to be crocheted granny squares. 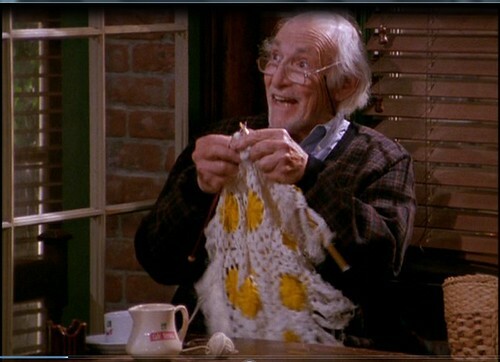 One would think that someone doing the show knew how to knit, because at one point the man is making fairly realistic knitting motions… but then again maybe not. I posted something about this (but no picture) on Plurk and got a response from Aesox about a Jockey ad with a spinning wheel churning out knitting. The picture is a bit hard to see – it’s possible it’s just really thick yarn and someone jammed a cake of it on a spinning wheel, but it’s hard to say. I’m sure there are many other examples of failed representations of fiber arts – in fact I know I saw one a while ago with a ball of yarn tangled around some needles of someone who was supposedly “knitting”. These originally started as the Hedgerow Socks, but it seemed like a lot of ribbing for not a lot of pretty. 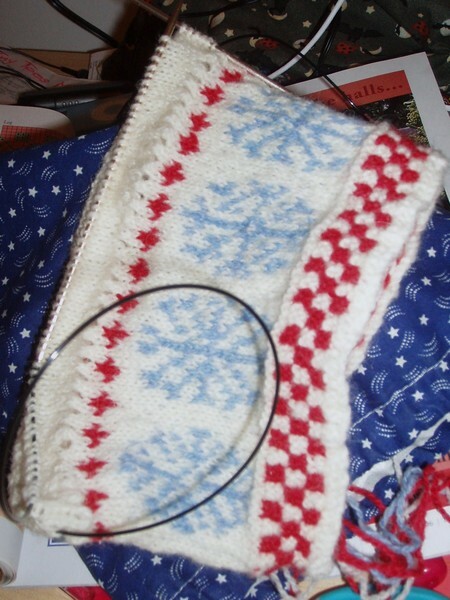 The pattern was just so plain, and it hurt my hands to be changing from knit to purl so much. 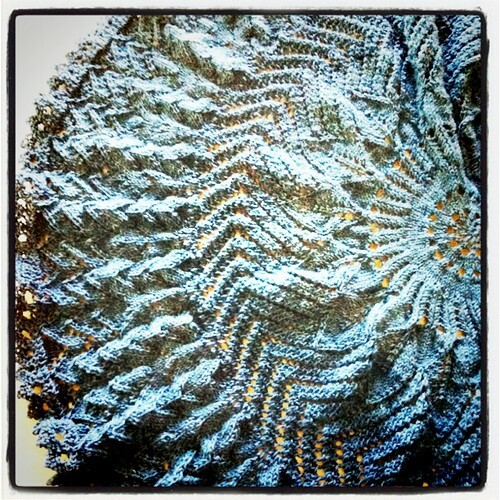 I decided to go back to one of my old standbys – Monkey is such an easy pattern to knit. The pattern is easy to memorize and it’s also easy to tell where you are in the pattern by looking at the stitches. 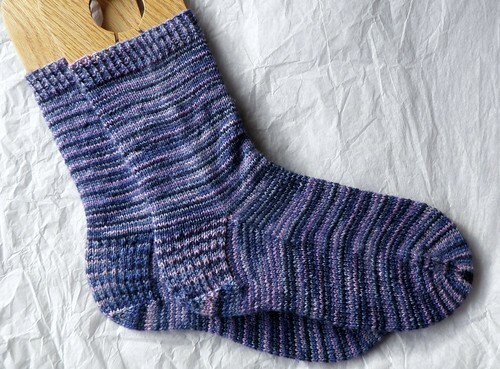 Plus it’s minimal work for what I think are very pretty socks. Yes, it is true. I haven’t posted in almost an MJ-long time. First there was sock camp… for almost a whole week of 24/7 knitting-related vacation you would think I would have gotten more knitting in. 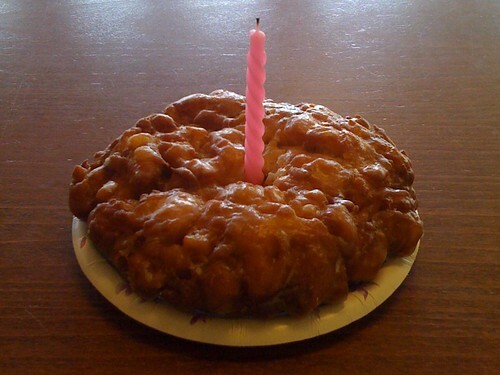 At work I got a birthday fritter! (There are many reasons I love my job, and this is only one of them!) My family stopped by to say hi too, and then went to my apartment. I came home to find these adorable star cakes and some balloons! It was a very nice birthday. And then there has been secret (test and gift) knitting which I can’t show, and I haven’t finished anything. Well, that’s sort of a lie. I did finish the lacy alpaca silk scarf that I was knitting at work, but it hasn’t been blocked yet and it’s for a store sample anyway. Speaking of work, we are having a big sale this weekend so it’s been pretty crazy. But it’s still really fun. I’m just trying to restrain myself around all that yarn! Hey family members, are you still staying away from my blog? I sure hope so! First off, the contest: I did not hear from Cindy so I’ve given up and I’m declaring a tie – Amanda from myonlysunshine and weezalana both guessed October 31st for the 100th sock finish. If the two of you could contact me I’ll let you know the deal on your handknit-by-me socks. 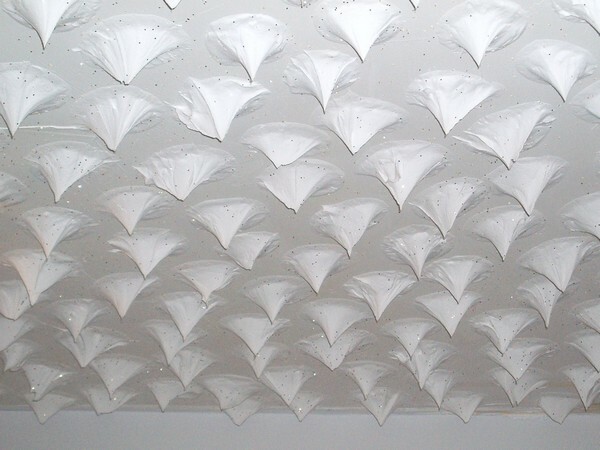 In a bit of randomness, while I was visiting Cathy this weekend I finally remembered to take a picture of her ceiling. It is rather amazing. It looks like someone went a little crazy with the spackle meringues and the glitter. Listening to: Wrapped In Plastic ~ Marilyn Manson, Miss Murder ~ A.F.I. I’m almost relieved that NaBloPoMo is nearly over. 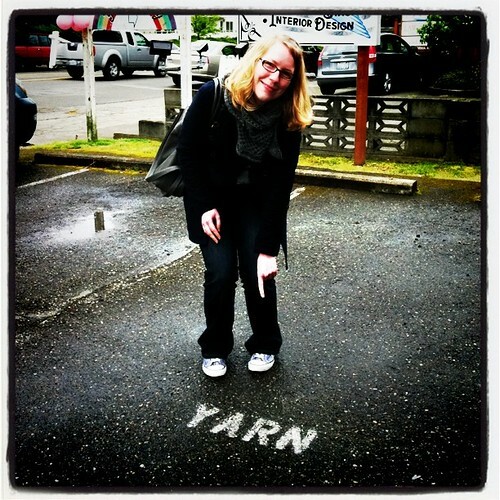 It’s been fun, but it’s also been a lot of pressure to knit interesting things to blog about. Well tonight I was knitting something interesting, but unfortunately it’s a gift and not something I can share on the blog. But you’ll see it later, really!